What's wrong with this kitchen lighting scheme? Can lights located in aisles cast shadow on tasks when the cook stands at the counter. Under-cabinet lights mounted against the wall cause glare. There are too few fixtures to light an island of this size. Read on for solutions that will bring better lighting to your kitchen designs. Most kitchens are woefully underlit. Lighting is often an afterthought, yet even when it’s carefully planned, designers and lighting experts often don’t agree on which lamps work best in particular fixtures and where those fixtures should be located. In what follows, I’ll look at factors such as the number of fixtures and the type of lamps (bulbs) used, but I’m particularly interested in the size and location of recessed can lights. 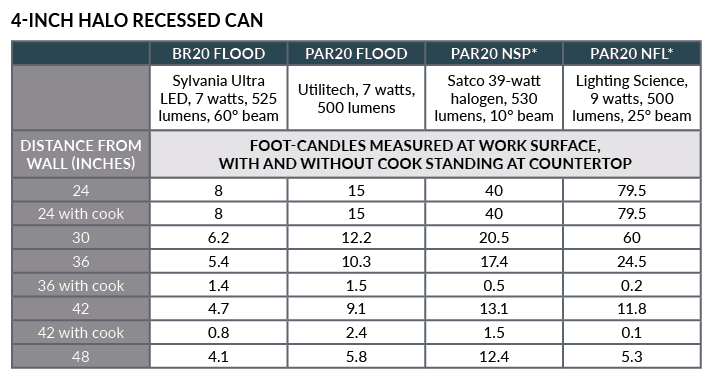 I’ve written about this before (see “The Right Way to Light a Kitchen"), but I recently measured comparative light levels on actual jobsites, and the data backs up my contention that, in most cases, the wrong fixtures are being placed in the wrong locations. There has been almost no new research on this topic for the last 30 years, and competing expert opinions leave designers confused about how much light is needed in the kitchen. The code isn’t much help: IRC 2015 requires just one light fixture for the entire kitchen, yielding perhaps 6 foot-candles (fc). That will help you avoid banging your hip on the corner of the island countertop, but it’s very dim light for working in the kitchen. Industry groups also weigh in on the topic. In the book Kitchen & Bath Lighting: Concepts, Design, Light, which the National Kitchen & Bath Association (NKBA) released in 2015, the text suggests 50 fc for prep counters. This jibes with the January 2017 update of the Illuminating Engineering Society’s (IES) “Lighting and the Visual Environment for Seniors and the Low Vision Population” (ANSI/IES RP-28-16), which also recommends a minimum of 50 fc at the countertop surface. My personal target is a 100 fc minimum, and even more for clients older than 60 (see “Aging Eyes Need More Light,” below). But I also put everything on dimmers, which enables users to soften the lighting while also saving energy and extending lamp life in halogens and LEDs. I believe there’s considerable misinformation about where can lights should be located in relation to countertops. In a couple of books used by kitchen designers, I’ve seen illustrations showing recessed can placement well away from the task. The illustrations don’t include dimensions, but out of curiosity I traced and enlarged them, then scaled them using the 25-inch countertop as a guide. In doing so, I found that one illustration shows the cans 49 inches out from the wall and another shows the cans a whopping 56 inches out. This spec seems to have originated in a kitchen lighting book that was popular in the ’90s. The book’s theory was that lights centered in walkways wouldn’t create “hot spots” on the upper cabinets and that under-cabinet lights would do the heavy lifting (see “Under-Cabinet Lights Won’t Save You,” below). I bought that book, but the advice in there to center the cans in the aisles made no sense to me, and I stopped following its guidelines after one or two projects. But it has bothered me that this bad advice is still being disseminated. Then, a few years ago, I met with a prospective client who complained of really bad lighting in his newly redone kitchen. This launched me on the path of putting numbers to good and bad lighting. Now I measure, before and after, every kitchen I’m asked to redesign. You can’t manage what you don’t measure. My opinion, based on common sense—and now also on empirical evidence—is that the proper place for can lights intended for task lighting is directly over the edge of the countertop, which is roughly 24 inches out from the wall. This location puts the beam right above the work surface and, equally important, it prevents the cook’s body from blocking the light when he or she stands at the counter working. It also throws light directly into open drawers. To test my theory, I first purchased one 4-inch and one 5-inch recessed can and a variety of lamps. 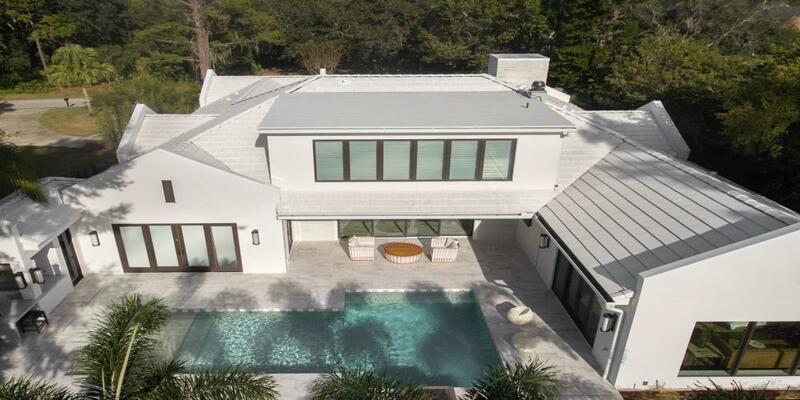 I then enlisted the help of current client Mike Flaherty, who is having a second-floor addition built at his 1920s bungalow, along with associated first-floor upgrades. Part of the under-construction kitchen ceiling was open, which made it possible—one evening after dark—for us to hold the can lights up at the proper height (5 feet above the counter) and at a variety of distances from the wall, starting at 24 inches and going out to 48 inches. I stood on a stepladder while Mike stood by the counter or in front of it (photos, above) and recorded the measurements from my trusty Meterman LM631 light meter. Could there be errors? Sure. For instance, I have two light meters, plus a light meter app on my Android phone, and each gives different readings. But I do trust the accuracy of the relative values from a single meter. 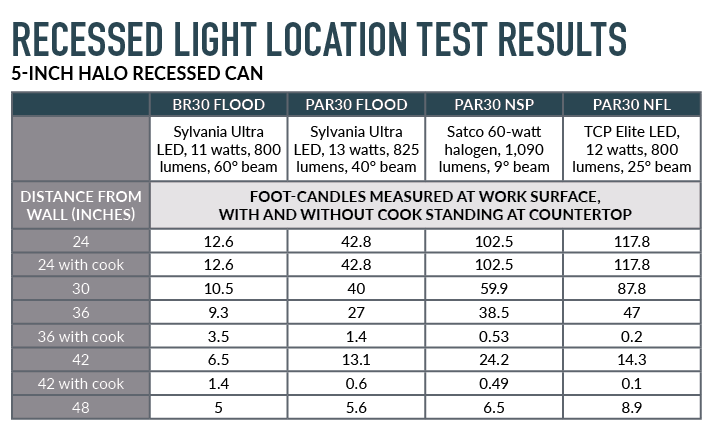 The results confirm that the location of a can light makes a big difference, especially when, as happens in the real world, people stand at their counters while they prep and cook (see the “Recessed Light Location Test Results” table, below). For example, with a PAR30 flood in a 5-inch can located 24 inches from the wall, I measured 42.8 fc at the work surface. When the can was moved out to 36 and then 42 inches from the wall, I measured 27 fc and 13.1 fc, respectively—drops of 37 percent and 70 percent. The reduction in light levels was more dramatic when Mike stood at the counter as if prepping (see “Actual Field Measurements,” below). With the can 36 inches from the wall, the 27 fc dropped to just 1.4 fc; at 42 inches out, the 13.1 fc plummeted to 0.6 fc—worse than candlelight! And with a 4-inch can, all of the results were about 30 percent lower. Placing cans in the walkways puts task lighting on the floor and spills ambient light onto the counter—it’s completely backward. Recessed cans are particularly inefficient for ambient lighting; better are surface-mounted or pendant fixtures that throw light in all directions. The bottom line: For task lighting, cans should be placed 24 inches out from the wall, centered over the edge of the countertop. The narrower the beam spread, the stronger the light levels on the task. 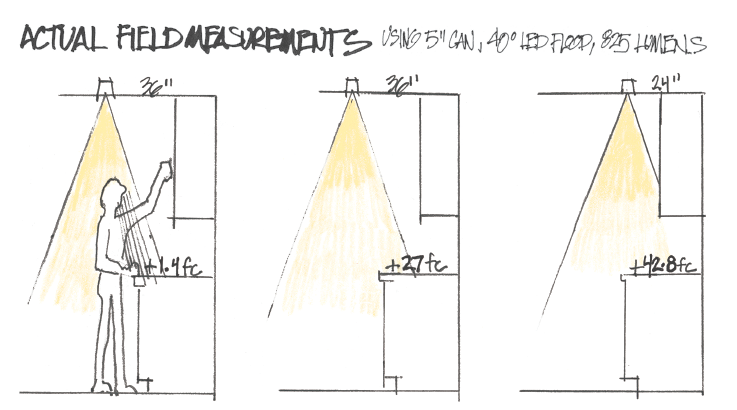 In a fixture 5 feet above the countertop, a PAR30 with a 40-degree beam spread creates a circle of light about 100 inches in diameter; a narrow spot with a 10 degree beam spread creates a circle of light that’s about 22 inches in diameter. It follows that beam spread affects the number of fixtures needed and their spacing: If you use narrow-spread lamps, you will need more fixtures spaced more closely together to achieve the same light levels. Larger can diameters deliver more light. This seems self-evident. However, I was surprised to find that the most intense narrow spot (NSP) in a 4-inch can didn’t have the punch to deliver the recommended minimum 50 fc from 5 feet above the countertop; I was also surprised that the narrow flood (NFL) did, delivering 79 fc. Again, lamp type matters. After seeing these results, I will continue my practice of placing cans directly above the edges of work counters. In a future article, I’ll share several recent projects showing light levels before we started, computer simulations of the new lighting layout, and actual measurements after the work was completed. I’ll also continue to use my go-to fixture and lamp—a 5-inch, airtight, IC-rated can with a 75-watt equivalent PAR30 NFL LED lamp. By itself, this spec puts down 117 fc on the countertop, and in concert with cans on either side (usually 3 or 4 feet apart) you can reach even higher light levels. You can also generate 100 fc with a single 5-inch can using an NSP lamp (9-degree beam), but you won’t find that bulb at your local big-box store. I use IC-rated cans everywhere, whether or not the ceiling is insulated, because if air can get through, then sound can, too. It also simplifies the fixture order. When Mike’s kitchen is complete, I’ll redo the foot-candle measurements with all of his kitchen lights on to see the cumulative effect. I’d also like to measure a 6-inch can with a PAR38 flood and spot to see how each performs in 10-foot ceilings. In addition, I want to measure output from an LED retrofit kit and from a low-voltage MR16 fixture with different lamps and beam spreads. Vision problems accompany aging, and for older people, poor lighting is a very real safety issue. Expert opinions differ on how much more light is necessary as people age, but there is clear consensus that more light is better. Under-cabinet lights are wonderful, but at kitchen sinks in front of windows, there are no upper cabinets to mount them to. The same goes for islands and modern loft-style kitchens, which use mostly base cabinets. Light from under-cabinet fixtures mounted against the wall can reflect off polished countertop surfaces and cause distracting glare. Mounting the fixtures at the front of the cabinet reduces this problem and provides a bit more light to the work surface. The other problem with under-cabinet lights is getting homeowners to use them. This is true for many of my clients, and I attribute it to their experience with the hot halogen or xenon fixtures that were popular the last time they remodeled their kitchen—you could keep pizza warm under those lamps. But LEDs have changed the game, and they come in different output levels, plus they’re dimmable. One huge advantage under-cabinet lights have is that they’re below the viewer’s eye level (except when seated) and are less likely to cause glare. The exception is when the counters are highly polished—which the great majority of countertops are—then the reflection bounces right up into your eyes. Honed or matte countertops help, but the real solution is to mount under-cabinet lights behind the front rail of the upper cabinets instead of at the back against the wall. This location changes the angles of incidence and reflection and may prevent the glare. It also helps to deliver foot-candles on the working area, which is toward the front of the counter, not the back. As I did find this article informative, when planning lighting for kitchens, I always prefer multiple types of lighting. I usually prefer recessed for general lighting, and under cabinet lighting for task lighting at counter, with a dedicated light at the sink (and island). The use of dimmers can further increase the functionality of the lighting. With kitchens not always being used strictly for work and food prep, but also for entertaining. Different lights for different purpose. Yes to Layers of Light! Steve, I couldn't agree more that you need different types of lighting for different needs. Task, ambient, decorative, and accent lighting all have a place in the modern kitchen, and with dimmers on everything, the possibilities are literally endless! And of course, a task light also provides some ambient light; one light can served several functions. A nice decorative pendant (or two or three) in the middle is the first light people would turn on, to navigate. Often that's all they need. As you correctly pointed out, the sink is often the destination for many kitchen trips, so a dedicated task light there makes great sense. Steve, I couldn't agree with you more; kitchens deserve more than one type of lighting. 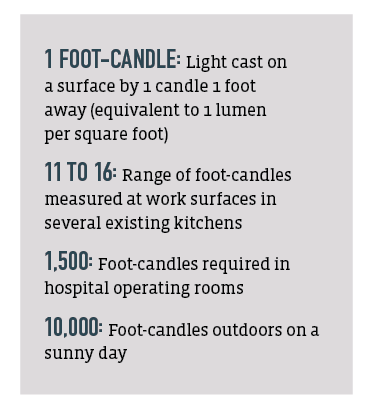 My focus is first to get adequate footcandles on the countertops (NKBA and IES recommend 50 fc MINIMUM). And most undercabinet lights won't do it by themselves; I recently tested 2 and one put out 15 fc, the other 20 fc. To get close to 50 fc, you have to specify high output led tape or undercabinet lights. Once we get the task lighting completed, we can talk about ambient, decorative and accent lighting. Well done, Doug. Your numbers confirm my practice of lighting my jobs, well over 200. i also always use air-tight housings and PAR LED lamps and yes usually 5 inch cans. Excellent excellent article! I can't count the number of times that I've fought with builders who say "I've never seen so many fixtures in a kitchen". Homeowners are never sorry! Light makes all of the difference, and your research is very practical. I'm going back to read your other article on kitchen lighting and will look forward to others in the future. There is no such thing as Overlighting! Ellen, Thank you for your spot-on observations. I too have had clients bring up to me during the electrical walk through, "Do you think we're overlighting?" But they always tell me afterwards how appreciative they are that we put them in where we did, and how they love the control it gives them. By the way, you can get a light meter app for your phone and start doing your own research! I just received the May 2017 issue of ProRemodeler. It was outstanding. In addition to being a contractor I work for the City of Morro Bay here in California. I assist the Building Inspector with inspections and training new personnel. I want to share the information on kitchen lighting with him. My wife, Kitty, works for the Braille Institute helping visually impaired members of our community. Most of them are seniors. 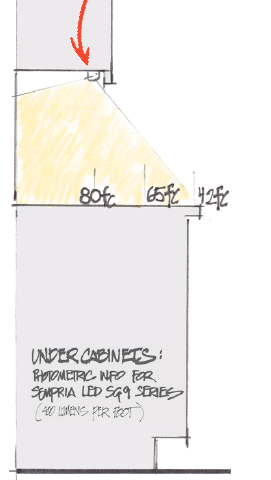 Your “Recessed Reconsidered” article was the best article I have ever read on task lighting that is understandable. Kitty will be taking my issue or your magazine to share with her students. I would like another May issue that I can have for my files. I am building a new home as we speak and will be implementing all of the suggestions by Doug Walter Architect. I've been researching kitchen lighting for hours and finally stumbled upon something helpful - thank you so very much for taking the time to research and present this information in such a digestible format. I am currently undergoing a complete kitchen reno and my builder and lighting designer are at odds on placement and even on can size. Builder says 6" and designer says 4" -- I see you like the 5" so maybe that could be a happy medium... ? I'm reading that some say the 6" look dated... I am worried about having enough light -- we cook a lot. Builder also suggests two cans in between my three cone shaped island pendants which designer does not agree with. We will have under cabinet lighting. Had no idea this was so complicated! Any guidance would be sincerely appreciated. Yes, 5 inch cans are a good compromise: big enough to do the job, but not so big that they call undue attention to themselves. 6 inch cans are overkill in an 8 foot ceiling, even a 9 foot ceiling. The amount of light you get depends as much on the bulb you pick as it does where the cans are placed: look for PAR fixtures which focus the light instead of spreading it widely, with little making it down to the counters. Builder suggestion of a couple cans amongst the pendants is a good one, sometimes the decorative pendants put out very little task lighting, so the cans could be called into play. Just put them on separate switches!